These days people don't take pictures and print them out as much as we used to. We now have digital cameras and programs like photobucket or facebook to share everything digitally. Plus, it doesn't cost money to take a picture with your digital camera and to save it on your computer. We keep up with each other online by checking out the pictures and status of our friends. As much as it is nice to not have to sift through boxes of photos or to even not worry about my photos being damaged over time, honestly I just hate this new process. I feel like the memories aren't as personal anymore. Even with the benefits of the web we have some how lost the personalizing of taking family photos each year. Plus when you go professional is seems you get suckered into spending a ton on professional quality prints, canvas's or frames! 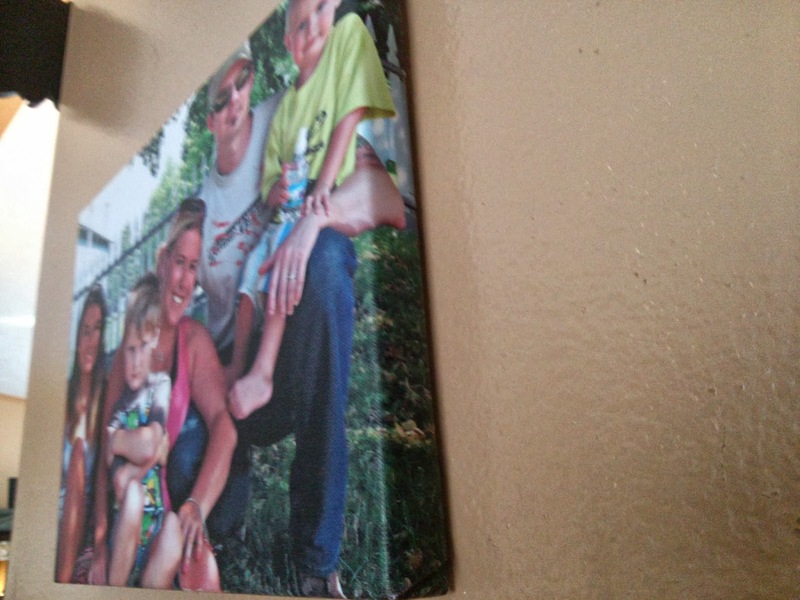 I was super pumped when Easy Canvas Prints contacted me and asked me to do a review for them. 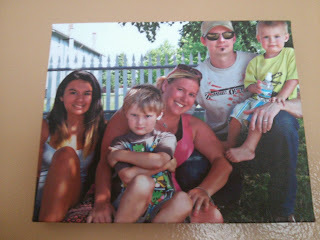 Easy Canvas Prints is a wonderful company that takes your photos and creates a beautiful picture to last forever. I was pleasantly surprised at how easy and quick it was to design your own canvas! You can choose from a single canvas or a wall display with several canvas's which make a collage on your wall! You can choose from several different sizes as well as choose from different options such as having the photo wrap around or upgrading the quality of your print. Recommendation: Super cool for any style home! With the quality and pretty great prices, you really can't go wrong. They are always having different sales and discounts too so you can usually find these for even cheaper! These would make a great gift as well for anyone! Giveaway: Easy Canvas Prints is going to give one of A Lucky Ladybug's lucky readers one 8x10 Canvas Print of their own! I'll use it to get a print of a photo of my friend's beloved dog who passed away last year. I love photo because the dog was black and white and I took the photo in front of a colorful mosaic, so he looks like a part of the artwork! I would use a picture that was taken this spring of my kids. It's a professional picture but I've yet to get it in a frame so I'd love to have it up on my wall! Id use a picture I have of all my grandkids dressed up for Halloween and give it to my husband. He has been wanting a large picture of them. I had some gorgeous fall photos taken of my kiddos outside this year! Would love to have one as a canvas! I would use a picture of the family for my mom. I would use it for myself. I have a picture of my two boy taken at the hospital after my youngest was born that I just love. They are both lying on the bed smiling at one another. I would use a picture I have of my little Princess. She passed on this summer, and it would be nice to have a nice picture on the wall. I would finally have the family picture from my daughter's wedding ( she just celebrated her 5th Anniversary) printed up. I love that picture because our youngest who was the ring bearer is now taller than the bride. How time flies. I would put on it a picture of my grandparents wedding day. I would keep it for myself. I'd use a picture of my two children for this if I won. They were actually smiling and looking like they liked each other for once! This would be for hanging on my living room wall for us to look at everyday to marvel at how they actually look like they love each other. I have a picture of my family at the Grand Canyon from vacation this past summer. It would mean a lot to me because my son is a senior in high school and we may not have any more family vacations with all of us together! I would use my Mom's wedding picture! If I win, I will get the canvas made for my husband, so it will be both a gift for him and a keepsake for both of us. The photo I I'll use is one of him and his girls, his doggie girls, that is. The photo is special to me because you can just see the love between him and the girls. And he will absolutely love it as he considers the girls just as much his kids as his human daughter....they have an incredible bond....thanks for the chance to win this for him. I would create a keepsake for my family and i'd use a picture of my two kiddos, perhaps this year's chirstmas card photo -i really like it! I have a picture of my parents at the beach this past summer, that I absolutely love...this would be perfect! I would use a picture of my daughter when she was a month old. She had a sunsuit on with a hat. So pretty. I would keep it for myself! I'd use a picture of my children as a keepsake for myself and decoration for my dining room! I have a picture of the kids in a tree that would be great to do on canvas which I would keep for myself. I love the picture because it's become a yearly tradition to get that shot to show their growth progression. I will use a picture of my kids. It's the cutest picture! They are all actually looking and smiling at the camera. My daughter recently had her senior pics taken. She had them taken in the woods behind our house. My 3 year old daughter and I walked along and watched while her pics were being taken. It was impossible to keep little sister from getting in a couple. One in particular of both my girls came out so beautiful I get teary eyed just looking at it. I would defineately pick that pic to put on canvas! I would love to have one of these of our wedding day. I would like to use my holiday photo that we have from this year! I would use this for one of two photos. I would either use a photo of my wedding. Or I would use a photo of the day my child is born. I just got a picture of my family with Santa that I would love to get a Canvas Print of to hang in our new home. My sister became a new mom this summer so I would use a picture of my new niece for their home. I would use it for the pic we have of our kids together with Santa. I would keep it and use the photo of me and the kids on the ferry at Disneyworld this past April!! Best vacation EVER!! !